Brad Grinstead was born in Dublin, GA. From 1998 to 2002, he attended Georgia Southern University where he earned a Bachelors of Science degree in biology. In 2002, he entered graduate school at Georgia Southern University where, two years later, he earned a Masters of Science degree in biology with emphasis in parasitology. His graduate thesis, entitled “Distribution of Hydrobiid Snails and the Prevalence of their Parasites along the Skidaway River,” focused on the parasites of the family Microphallidae. In addition, he also examined the first intermediate host, hydrobiid snails, and its salt marsh habitat. Parts of his research have been published and presented at scientific conferences. In addition to his research, Brad participated in leadership roles both departmentally and at the university level. He was the president of the Biology Organization for Graduate Students and a committee member on the Graduate Student Advisory Committee. Past memberships include the American Society of Parasitologists and the Southeastern Society of Parasitologists. Brad taught at the undergraduate college level while pursuing his Masters Degree. This classroom and lecture-hall experience heralded his chosen vocation as a Catholic educator. He has dedicated himself to studying Catholic educational theory and praxis according to such diverse masters as Saint John Bosco and Doctor John Senior. Currently, he is on the faculty of Immaculate Heart of Mary School, where he teaches physical science, natural science, algebra and trigonometry to students in grades eight to twelve. 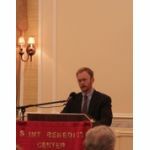 More recently, he accepted the position of Membership Director for the Third Order of the Slaves of the Immaculate Heart of Mary. A convert himself, Brad sees his educational work as part of the larger crusade to convert America. He and his wife, Amanda, are rearing their family in Richmond, New Hampshire, near Saint Benedict Center.